QTodoTxt: Why We Should Do Better! Last month I released v1.2.0 of QTodoTxt and this release was both awesome and horrible. Awesome because for the first time I’ve got external contributors, great new features and a lot of download (more than 300 in one month). And it’s when I saw those numbers that I realized that QTodoTxt wasn’t a toy project anymore. 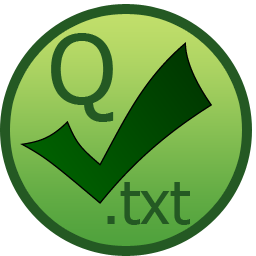 Obviously it’s useful to someone and because I have users I have to make QTodoTxt better for them too ! We had a code regression because I was not paying enough attention to my tests. We introduced a lot of new features but never took the time to document it. So the next version (v1.3.0) will be focused on packaging and documentation. Not very glamorous but I think it’s necessary. I will only include 1 new feature and the regression’s fix. If you have a little time, any help is welcome !